These chicken wings are an easy recipe to prepare in advance, and then simply fry before serving. You can use the entire wing if you like, but these are best with just the wing drumsticks (the piece of wing from the shoulder joint to the next). It gets a little messy to eat the whole wings with fingers, but the drumsticks work just fine to eat standing up and with fingers. Feel free to leave the skin on as it becomes crisp when fried. Mix together all the ingredients for the marinade except the rice flour and cornflour and rub the mixture over the chicken wings. Place in the fridge to marinate for 4 hours (or if possible overnight). In the meantime, make the dipping sauce. Heat the oil in a pan, add the star anise and stir for 30 seconds, then add the shallot and sweat over a high heat for 2–3 minutes, stirring continuously. Add the pineapple and continue cooking over a high heat for another 2 minutes until the pineapple is caramelised at the edges and is beginning to soften. Reduce the heat, add the ginger, tomato ketchup, soy sauce, sugar and 120ml of water and bring to the boil. Cook for 1 minute or two until the sauce turns glossy, check the seasoning and remove from the heat. Add the lime juice, cool and set aside. To make the green chilli mayo, blend the chillies and coriander with the oil in a blender until fine. Whisk together the egg yolk and mustard, then make an emulsion by adding the blended chilli-coriander oil a little at a time, until all the oil is used. Season with salt and lemon juice and set aside. When the chicken has been marinated, drain the excess liquid that has come out of the chicken. Mix together the rice flour and cornflour, then dredge the chicken wings in the flour a few at a time, so the chicken wings are dry. 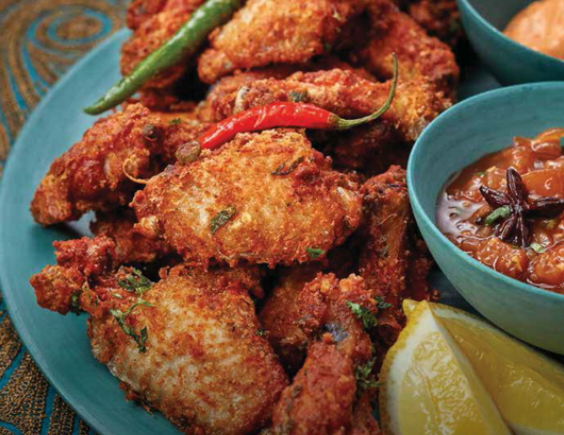 Heat the oil to 180ºC and fry the chicken for 6–7 minutes in small batches until cooked through and crisp. Take care not to crowd the oil with too many wings at the same time as the coating comes off and the wings won’t be as crisp. Drain on kitchen paper for 5 minutes, then sprinkle over a little chopped coriander. 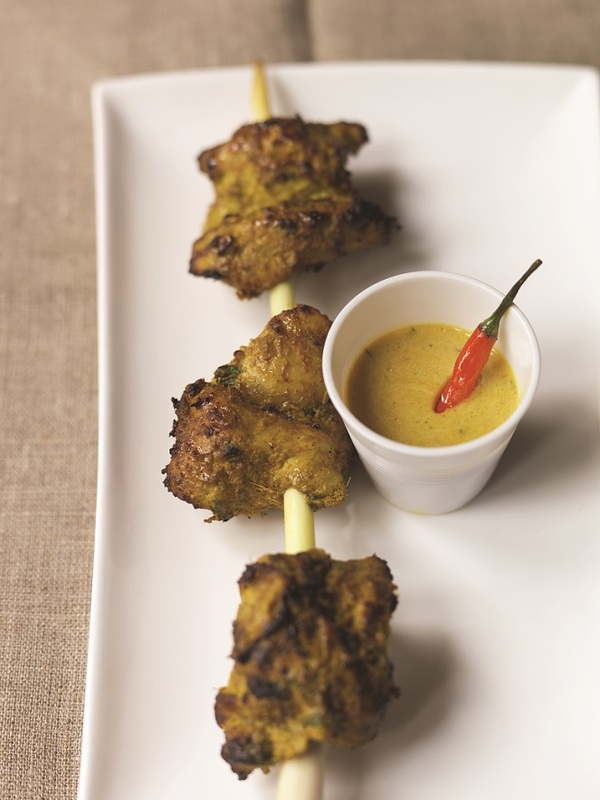 Serve accompanied with the dipping sauce and the green chilli mayo. 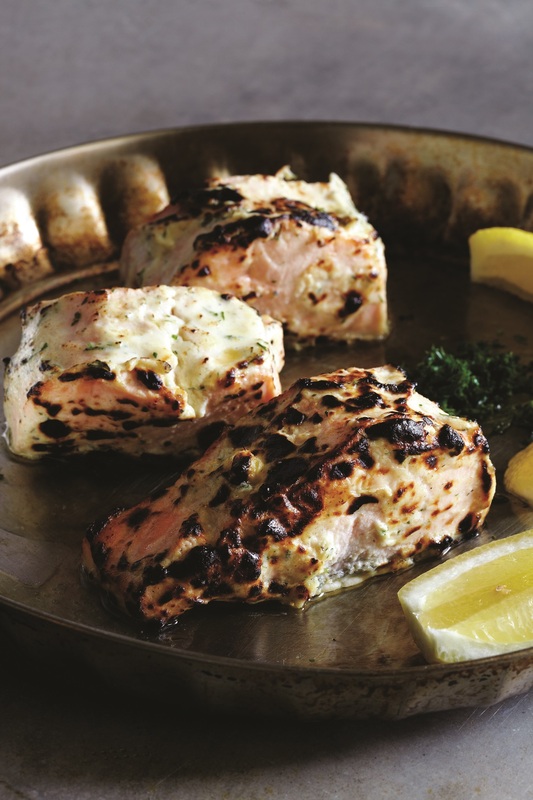 This recipe for tandoori-style salmon gets an unusual twist from the addition of horseradish in the marinade, a very British combination. Wash and pat dry the salmon fillets. Mix together all the ingredients for the first marinade, and then rub them all over the salmon fillets and leave to marinate for 15 minutes. For the second marinade, mix together all the ingredients, then rub them over the salmon and leave to marinate for an additional 15 minutes. Use long metal skewers to skewer the fish chunks and place, skin side down, on a baking tray. Roast the salmon in an oven preheated to 200C/Gas Mark 6 for 7 minutes, then place under a hot grill for 2 minutes. Alternatively, place the fish skin side down on a hot barbecue and cook for 10-12 minutes, turning them over every 3-4 minutes, until the skins are crisp and well coloured. Serve with lemon wedges and chutneys of your choice. 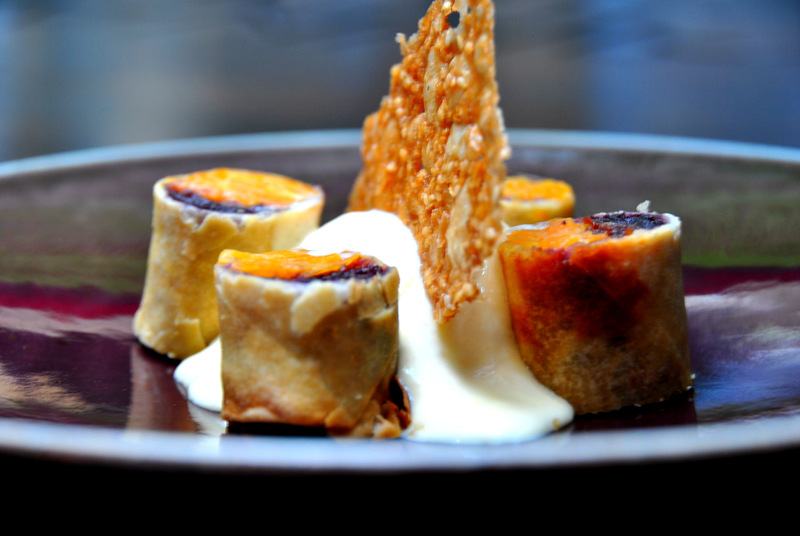 This is an example of a dessert we used to serve in Cinnamon Kitchen and shows how we gave a popular European dessert an Indian spice treatment. This can be a great dessert to prepare for your loved one on Valentine’s Day or of course for any of your other dinners. It is actually not too hard to make but it will definitely be a crowd pleaser. When I can get them, I like to use the small Indian bananas that have a nice acidity and sharpness to them; but feel free to substitute with regular bananas, or you prefer. The tart is enhanced by the delicate aromatic spice and bite of the pink peppercorns. To make the caramel, put the granulated sugar and water in a small, heavy-based pan and heat gently, stirring occasionally, until the sugar has melted. Increase the heat and cook, without stirring, until it forms a dark golden caramel. Add the butter, standing well back in case it splutters, then simmer for 8 minutes. Remove the pan from the heat and pour into a greased 20cm cake tin to coat the base. Leave until cool and set. Peel and slice the bananas and arrange them in overlapping circles on top of the set caramel. Sprinkle the pink peppercorns over. Now roll out the puff pastry to about 3mm thick and cut out a 23cm round. Cover the bananas with the pastry, tucking the edge down inside the tin. Bake in an oven preheated to 190°C/Gas Mark 5 for about 15 minutes, until the pastry puffs up and turns golden. Remove the tart from the oven and invert it on to a plate so the bananas are on top. Alternatively, you could make individual tarts, as we used to do in the restaurant (see picture), using 12cm discs of pastry and smaller tins. The larger tart is an easier one to make and share at home. To make the iced double cream, mix together the sugar and milk powder in a heavy-based saucepan. Add the whole milk and cream and bring to the boil. Pour into a blender or food processor and quickly blitz. Strain into an ice cream maker, and when it is almost frozen, fold in the black cardamom pods and finish churning. Transfer to the freezer. 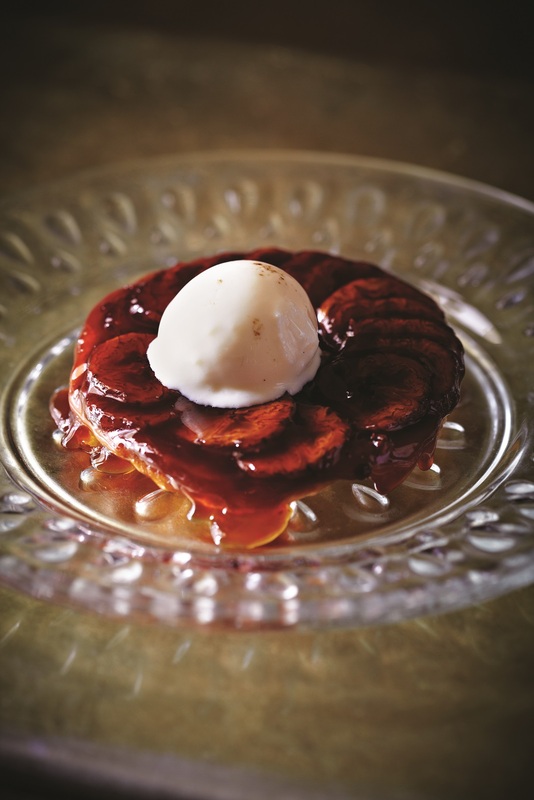 Serve the banana tarte tatin hot with the Black Cardamom Iced Double Cream, or use any other ice cream you’d prefer. This is a very good vegetarian main course, and easy enough to put together – an ideal dish that allows for better appreciation of colours, flavours and textures. First make the dumplings. Mix in all the ingredients for the dumpling to form a smooth dough. Divide the mixture into 12 individual balls, the size of golf balls. For the batter coating, make a smooth batter with the gram flour, ajowan, salt and water. Place the shredded spinach in a tray. Dip the balls in the batter and roll them in the spinach to form a good overall coating. The dumplings are now ready for frying. When you are ready to serve, deep-fry the dumplings at 180°C degrees for about 1½ minutes until crisp and golden green. For the sauce, wash and cut the tomatoes in half, place them in a heavy-based pan on a medium-high heat and, as they soften, pour in water, add the garlic, crushed ginger, lime leaves, lemongrass and the whole spices and boil until the tomatoes have disintegrated. Add the bay leaf, salt and red chilli powder and cook for a couple of minutes, then pass the tomatoes through a sieve to get a fine tomato purée. Bring the purée back to the boil, add the coconut milk, stirring constantly and, when the sauce turns glossy, add the kadhai masala and sprinkle in the garam masala powder. Check the seasoning and add sugar if required (sugar helps to balance the sourness of the tomatoes). 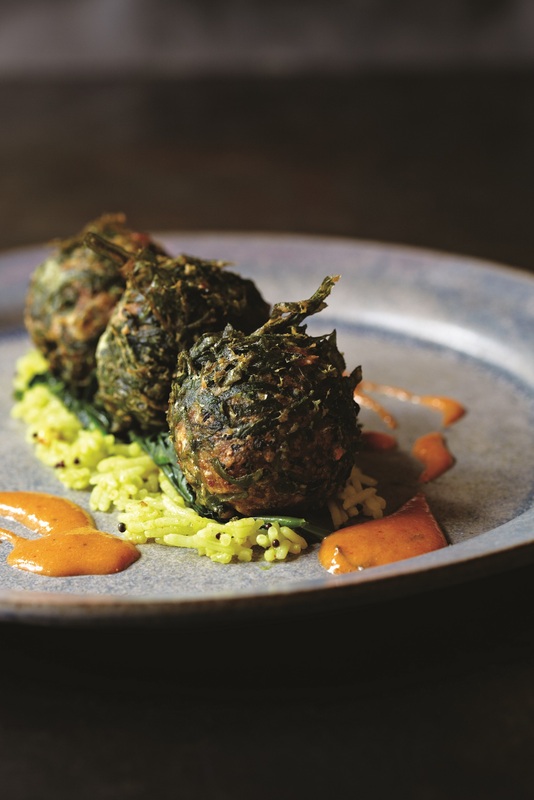 Divide the rice between 4 serving plates and serve with the spinach dumplings and the sauce poured around. This is a modern interpretation of a typical, everyday Indian dish of dal-roti and kukkad – i.e. lentils, bread and country chicken. Even though guinea fowl became more and more available all year round, I still think the winter season is great for cooking with poultry and game. For the marinade, mix together the ginger–garlic paste, salt, chilli flakes, chilli powder, allspice and lemon juice, then rub them over the guinea fowl breast pieces and set aside. In the meantime, mix half the coarsely ground spices with the yoghurt and coriander stalks. Apply this mixture to the breast pieces to complete the marinade, thread the guinea fowl onto the wooden skewers and set aside while you prepare the sauce. To make the lentil sauce, rinse the lentils under cold running water, then place in a pan with the water, turmeric and salt. Bring to the boil, then reduce the heat and simmer for about 25 minutes, until the lentils have thoroughly disintegrated. Blend the mixture to a purée with a hand-held blender. Heat the ghee in a heavy-based pan, add the whole dried chilli, asafoetida, and cumin seeds and let them crackle. Add the garlic, wait for it to turn golden brown, then add the onion. Sauté over a moderate heat until golden. Add the tomato and cook for 3 minutes, then pour in the puréed lentils. Stir in the ginger and coriander and bring to the boil. Adjust the seasoning and finish with the lemon juice. To cook the guinea fowl, heat the oil in a large, ovenproof frying pan (big enough to accommodate the skewers) and sear the guinea fowl skewers for 2 minutes on each side. Sprinkle the rest of the coarsely ground spices over the guinea fowl, then transfer the pan to an oven preheated to 200°C/400°F/Gas Mark 6 and cook for 6-8 minutes. Serve on the lentil sauce, accompanied by bread or rice. Tip: The guinea fowl could be replaced with chicken breasts or thighs and the skewers will cook every bit as well under a grill or on a barbecue. 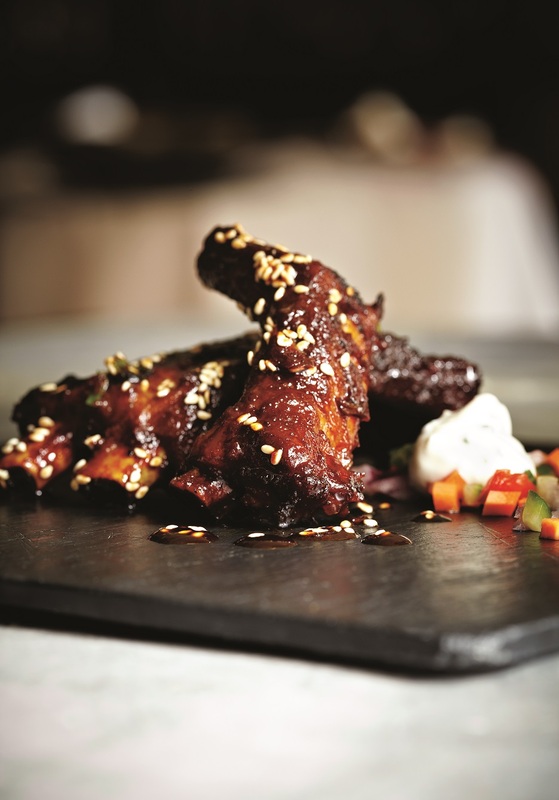 For the month of November I am sharing this finger licking delicious Charred Pork Ribs recipe. This method of double cooking ribs – first cooking in liquid and then grilling – gives a fantastic silky, fall-off-the-bone texture and deep rich flavours. Yes, you can argue that the spicing is quite Chinese, but, hey, it’s the second most popular cuisine in India! The hot, sharp mustard dressing, with its delightfully big flavours will leave you licking your sticky fingers for long after the ribs are gone. Mix together all the ingredients for the marinade in a large bowl, then rub them on to the pork ribs and leave for an hour (or considerably longer if you can). Put the pork ribs in a roasting tray and add just enough water to cover the ribs. Check the seasoning, as the cooking liquid should be correctly seasoned before the ribs are placed in the oven. Put the ribs in a roasting tray, covered with foil. Transfer the tray to an oven preheated to 190°C. Cook for 60 minutes. Remove the tray from the oven and separate the ribs from the stock. Set aside the ribs to cool and for the meat to firm up. Meanwhile, make the dressing. Beat the oil, mustard, honey and lemon juice together until a smooth emulsion forms. Set aside. Strain the stock into a heavy-based saucepan, then boil the stock until it reduces and thickens without tasting too salty. Add the remaining soy sauce, honey and malt vinegar and simmer for about 15 minutes, stirring, until the sauce is a thick glaze. Check the seasoning to make sure it isn’t too salty, which it can be if the glaze has reduced too much. If it tastes too salty, add more honey. Place the pork ribs on a baking sheet on a hot barbecue for 2-3 minutes, brushing with the glaze, until they are coloured. Move the ribs to the edge of the barbecue (where it is cooler) and brush with more glaze. Cook for a couple of minutes, turning continuously to get a deep rich, shiny caramelised gloss on the ribs. Sprinkle with sesame seeds and serve hot with chunky kachumber and spiced cucumber, onion and tomato salad. Alternatively, the final cooking stages can be done in the oven, reducing the heat for the second stage. Carrot halwa in its traditional form must be India’s most recognisable dessert as it is cooked in most Indian homes in winter. Carrot halwa is a great dessert for for instance Diwali and it is not very difficult to make. Divide the ghee between two separate pans and heat it up. Add the two different grated carrots to separate pans and sauté for 10 minutes over a low heat until the juices from the carrots evaporate. Add half the sugar, raisins and ground cardamom to each pan and cook until the sugar melts. Divide the evaporated milk between the pans and cook until each mixture takes on the look of orange-coloured fudge. Spread the mixtures on two trays and let them cool. Divide each mixture into six equal parts. Take a spring roll pastry sheet and brush the edges with melted butter. Place on a diagonal on a work surface. Place one heap of orange carrot fudge and one heap of black carrot fudge towards the corner closest to you. Take the same corner of the pastry, fold it over the carrot and continue rolling it until you reach almost to the middle of the strip. Tuck in from both sides, then continue rolling until you reach the end of the pastry. Seal the edges with a drop of water. Repeat the same process with the remaining sheets. Heat a deep pan of oil to 160 degrees Celsius and deep-fry the spring rolls for 4-5 minutes until they are golden brown. Drain on kitchen paper. Serve hot with ice cream of your choice. Tip: You could also make these smaller, and serve them as pass around desserts at the end of a canapé meal. The finished rolls will keep for 24 hours in a sealed container. Warm through before serving. 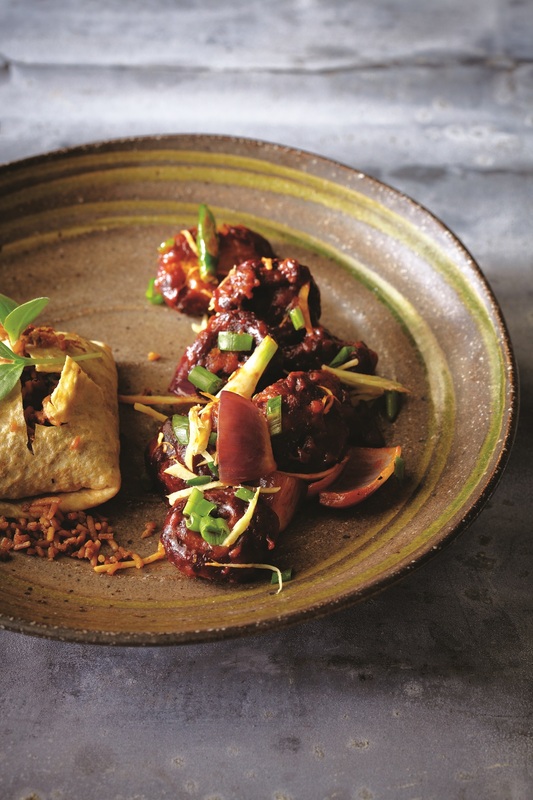 A Chinese influence is evident in this vegetarian feast, but the most distinguishing feature of the dish is the thin omelettes we make to envelop the stir-fried rice. The mushrooms on their own are also good to pass round as a snack with drinks. First make the omelettes. Break the eggs into a bowl and beat them lightly with the soy sauce. Heat a few drops of oil in a large, non-stick frying pan and pour in one-quarter of the egg mixture. Cook, without stirring, on a medium-high heat until the omelette begins to set, then remove the pan from the heat (without turning the omelette over) and leave the omelette to finish cooking in the residual heat. Remove from the pan and make 3 more. Set aside and keep warm. Mix together all the ingredients for the marinade in a large bowl, add the mushrooms and set aside to marinate for 10 minutes. Meanwhile, make the egg-fried rice. Heat the oil in the frying pan, add the beans, chillies, ginger and the peas and carrot, if using, and stir-fry, on a high heat, for 1 minute. Add the soy sauce, ketchup, salt and pepper and stir-fry for another minute. Break the egg into the pan and scramble, on a high heat, for 30 seconds, then fold in the rice and sesame oil and stir until mixed well and heated through. Lay the omelettes on a work surface, divide the egg-fried rice between them and wrap each to make a neat parcel. Set aside and keep hot. To deep-fry the mushrooms, heat enough oil for deep-frying in a deep-fat fryer or a deep, heavy-based saucepan to 190°C. If necessary shake any excess liquid off the mushrooms before deep-frying for about 3 minutes, until they are crisp and golden. Drain well on kitchen paper. For the stir-fry, heat the oil in a wok or large frying pan until smoking point. Add the dried red chillies and stir them quickly. As they start to darken, quickly stir in the garlic. Almost immediately it will start to change colour. Now add the onions and the deep-fried mushrooms and stir-fry for a couple of minutes. Add the bamboo shoots and stir for another couple of minutes. Add the sugar, chilli powder, cumin and salt and stir-fry for another minute. Add the soy sauce and mix well. Finish with the lemon juice and sprinkle with the spring onions and chopped chives. Serve immediately with the egg-fried-rice parcels. Tip: The secret of any stir-fry is that you should never let the heat in the pan go down; the heat of your burner should always be on maximum the whole time. Add an ingredient to the pan only when you think it’s hot enough. This is my take on a tandoori fish tikka traditionally served with green chutney. 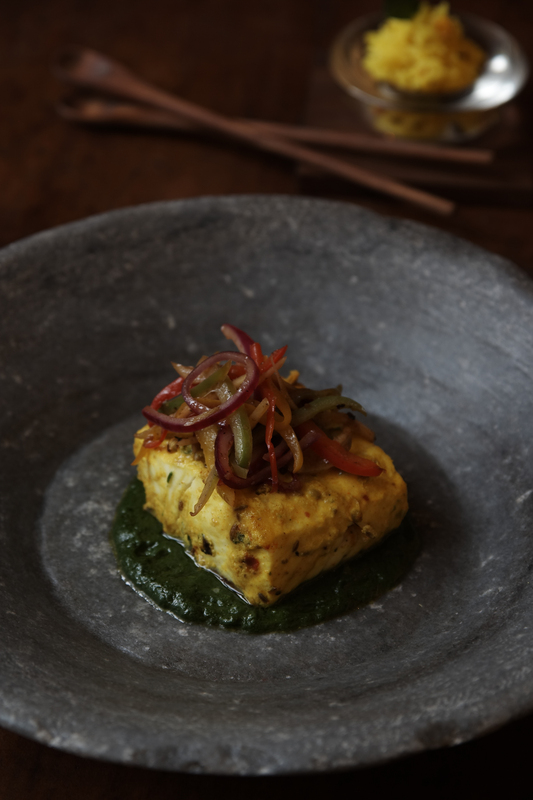 Only difference being we are using larger cut of fish, marinated using the same techniques but cooked in an oven and the coriander and mint chutney is transformed into a hot sauce. Served along with lemon rice, it makes for a stunning main course. Pat dry the fish pieces on a kitchen paper, marinate with the ginger and garlic pastes, turmeric and salt and set aside for 10 minutes. Heat vegetable oil in a Teflon coated pan and sear the fish for approximately 1-2 minutes on each side, remove from fire, drain using kitchen cloth and keep warm. Mix all the ingredients for the second marinade and spread them over the fish. Place the halibut on a baking tray and cook in an oven preheated to 220°C/425°F/Gas Mark 7 for 8-10 minutes, turning once. In the meanwhile prepare the sauce, first of all mix the mint, coriander and green chillies, water and half of the oil together and blend to a smooth paste. Heat the oil in a frying pan; add the garlic, onions, and sauté till golden. Add the chickpea flour and stir for a few seconds till they turn golden brown in colour, sandy in texture and a nice roasted aroma begins to be released. Add the ground paste and seasonings and cook for about 2-3 minutes more without discolouring the sauce. Finish with a squeeze of lime and serve the fish with the sauce and lemon rice. Tip: You could apply both the marinades together without searing the fish if you were in a hurry. If preparing for a dinner party, the fish may be marinated a day before and simply cooked in the oven for 12-14 minutes before serving. 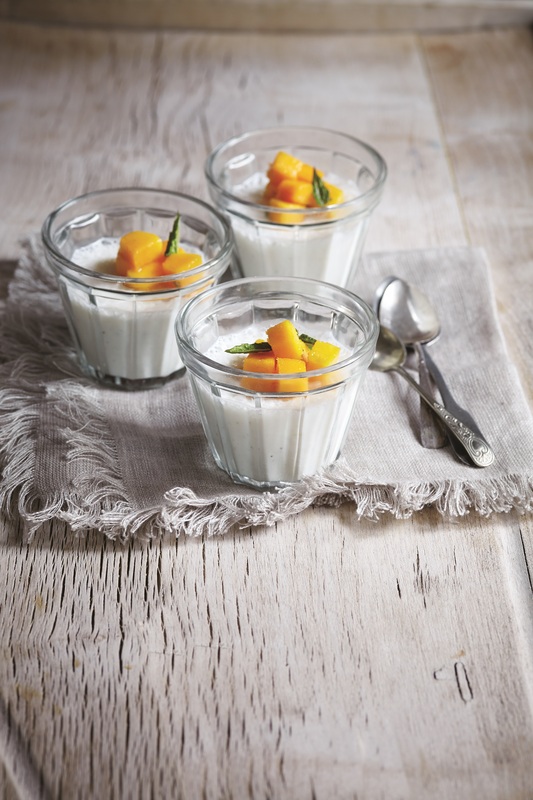 Lassi Panna Cotta – a fresh, summery dessert accompanied by juicy, sweet mangoes, perfect at this time of year. Anyone who has travelled to India in the summer will be familiar with Lassi stalls that pop up all over small towns and cities during the summer months serving these cooling drinks at the peak of hot unbearable summers. I love using the inspiration of lassi, a smoothie type drink and turning it into a simple dessert which is great for summer afternoons but also for entertaining big numbers. Soak the gelatine leaves in 100ml of cold water to soften them. In a mixing bowl whisk the yoghurt, milk, sugar, salt and cardamom powder until it turns frothy. Melt the gelatine in 100ml warm water, and then add to the yoghurt mixture. Mix well and pour into individual moulds or serving bowls. Chill in the fridge for a couple of hours, or even overnight if you have time. Mix the diced mango (or seasonal fruits) with chaat masala and set aside for 15 minutes to make a fruit chaat. Serve the panna cottas with a mango chaat garnish or with any seasonal fruit salad.